First, I got a Louisiana State driver’s license and registered to vote. Then, I registered my car in the state. But, I wasn’t done yet. In L.A., we had to get a smog check once a year. In New Orleans, you’re not road ready until you get a “brake tag.” People take the brake tag very seriously. So seriously that the woman at the DMV told me not to put on my new plate until I had the brake tag. Everyone made it sound like a very serious test. Many had pointers. I drove to a gas station that gives the test and pulled up to a woman in giant gold earrings and turned on all my lights, blinkers and wipers. I honked my horn. She had me sign a piece of paper, said, “27 dollars” (I had a $2 late fee) and slapped a sticker inside my windshield. Done. In L.A., they do all that for you then stick a tube thing up your exhaust pipe and run the engine in idle, then on wheels, and run the outcome through a computer. There’s really no way to know if your chemical mix will be acceptable until the computer prints the outcome. $40. But, I never minded because there are too many cars in L.A. and there’s too much pollution and this is one way we can all try to do better. New Orleans isn’t very dense and lots of people walk, ride bikes or scooters, or take the bus or streetcar. I’ve driven less than half the miles I did in L.A. and any of my friends can tell you I barely drove in L.A.
To that end, I spent both Saturday and Sunday afternoon in the French Quarter. I’ve always been so inspired by that neighborhood. I’m an avid people watcher. I collect human oddities like others collect baseball cards. I try to capture moments like postcards. And the Quarter is chockablock with human oddity and postcard moments. It was a GORGEOUS weekend. Sunny and breezy and in the 70’s. Walking past the French Market, we passed a makeshift dance floor full of couples wearing numbers while spinning and swinging. 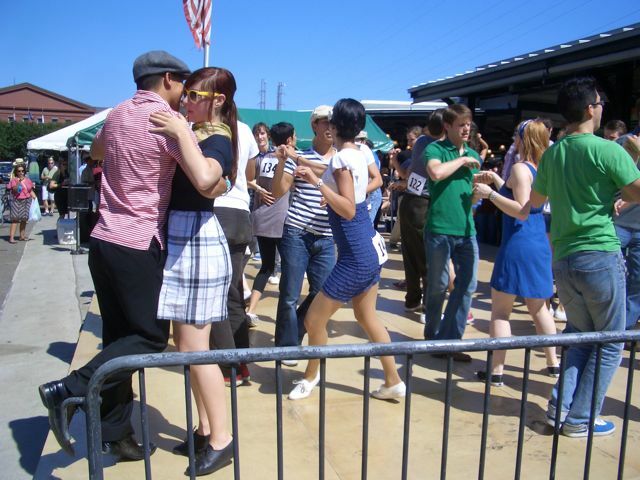 It was “The Ultimate Lindy Hop Showdown.” Fun! I love that every single day in this city, people are celebrating something. Enjoy the photos below. Sitting on a stoop for about 20 minutes, I said hello to at least 15 friendly strangers just walking by. I saw a man in a white shirt, black bow-tie and slacks and a black and white cap carrying his trombone, headed for work. In this environment, he fits in like a guy in a Brooks Brothers suit carrying a briefcase in New York or someone reading a script, memorizing lines while driving, in L.A. I liked him for no reason, just because that’s what going to work looks like for him, carrying a trombone (with no case) through the streets of the Quarter. Then, I heard a chanting, “I’ve got tomatoes, I’ve got apples,, I’ve got bananas” all sing-songy. It was Mr. Okra, the last of a dying breed of fruit and vegetable vendors who used to wind through the streets of this town selling their wares. I’ve heard of the blackberry lady who used to walk Uptown on St. Charles, chanting, “blackberries.” But, she’s just one of many legends now. Only Mr. Okra remains. He’s like the ice cream man for garden goodies. The people of this town love him so much that when his truck broke down, the city held a fundraiser. The reaction was so large that his truck ended up being donated and the thousands raised were used to ready the vehicle for it’s new life as his metaphorical mule and cart. 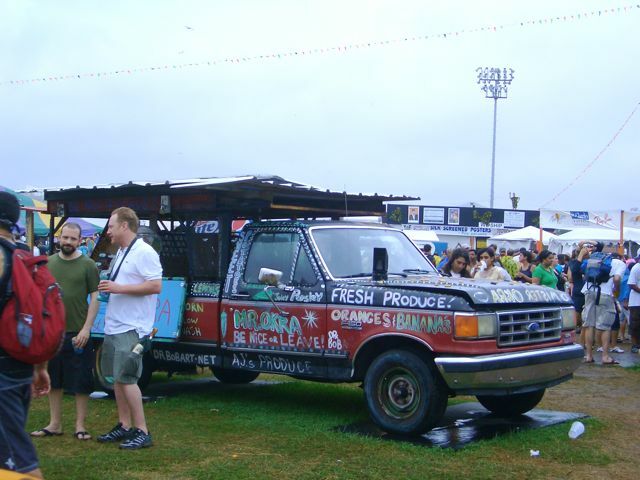 Dr. Bob even donated his painting skills and brought the truck to the same quirky, colorful wonder it had been. What I didn’t know was that the engine was long ago dead and some kind people arranged to tow his truck to the festival. Like the horse drawn carriages that passed me every five minutes or so pointing out the shotgun and camelback style homes where I was stoop-setting, Mr. Okra is a reminder that these roads were made for horses, that people lived here without air conditioning or refrigeration, that women wore elaborate gowns and men wore fancy suits with hats. Sometimes, when I squint my eyes against the cars and power lines, it’s my grandmother’s era, a time before television and cell phones (and civil rights – nothing is ever as good as nostalgia wants us to believe). 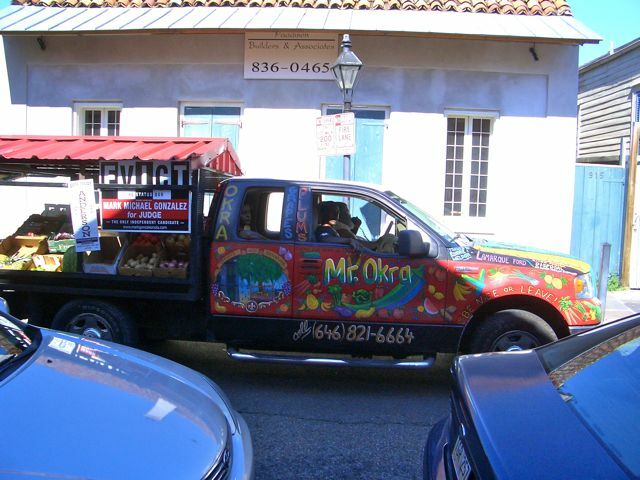 I’m glad I live in a place where Mr. Okra still exists, downright proud I live in a city that valued him enough to keep his business alive. Driving back to the Garden District along Magazine Street, the streets were suddenly filled with well-dressed people carrying cups of wine. I’d totally forgotten that, not only was “The Ultimate Lindy Hop Showdown” in town, the “Art for Art’s Sake” event was also taking place. Art for Art’s Sake is a weekend devoted to getting people to wander the many art galleries, shops and restaurants on Magazine. You couldn’t get away from celebration in this town if you tried. Sunday was game day, so we did a little unintended pub crawl searching for the perfect place to watch the game. First stop shall remain nameless as I’ve enjoyed myself there before, but the person working the bar for the game seemed totally disinterested in doing her job. Plus, of their 4 screens, the largest one was on 3 second delay from the others so, we were all cheering at separate times. Next up was Johnny White’s, best known for being the only bar to remain open during the entire storm and aftermath of Katrina. In fact, they haven’t closed their doors, not once, in 19 years. But, there were no seats and a large group of people from Georgia was being very loud, yelling cuss words at the players when they would make the mistakes so inevitable in pro football, things like being subject to gravity. I didn’t want to hear a Kate Gosselin-alike call Shockey (who actually had a heck of a game) an idiot or assh*le, so on to the next. The nice thing is that you can take your beer with you from one bar to the next, so you’re not being encouraged to guzzle booze to get your money’s worth. The last spot was Pat O’Brien’s, home of the Hurricane (a super-strong rum drink in a giant hurricane glass). The flaming fountain courtyard, beer stein collection hanging from the ceiling and dueling pianos bar have helped it to sell more alcohol per square foot than any other place in the country. 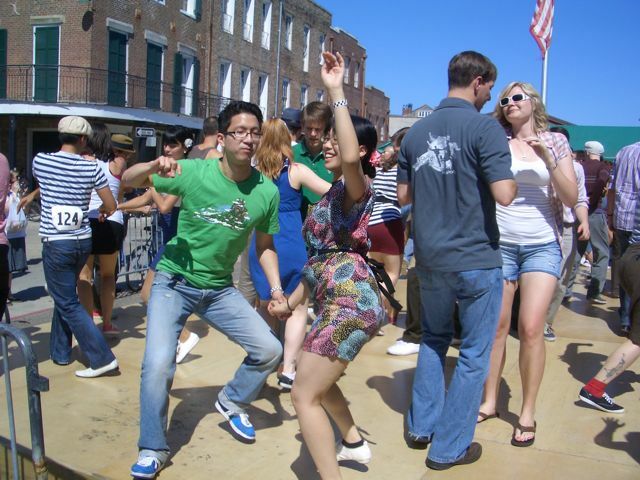 I like taking visitors to Pat O’s but don’t really think of it as a bar for locals. I wasn’t optimistic. But there were seats open right in front of the GIANT screen, they were serving free chili dogs and their beer was half the price of Johnny’s. I ended up meeting a very nice woman and her paramour. They bought us a round of drinks and told of their tales trying to find the perfect spot to watch the game. She worked at a lab that runs drug tests, he was a former executive chef now serving children and trying to educate them about eating. Great folks. A final word on game day in the Big Easy. When I say everyone wears jersey and Saints shirts, I mean that even the preachers wear Who Dat gear on game day. They say prayers for the team at local churches. 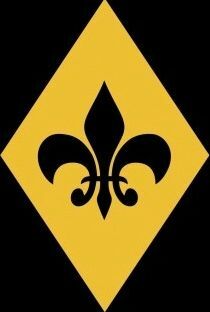 Every man, woman and infant is rigged in Saints gear. Me too. And proud of it. 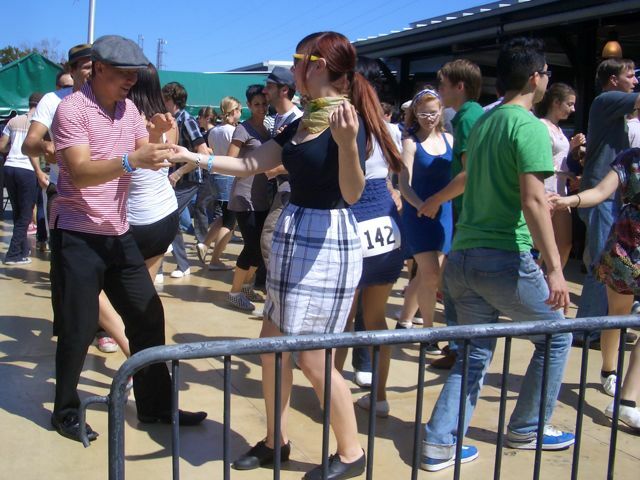 Moments from the Lindy Hop contest. 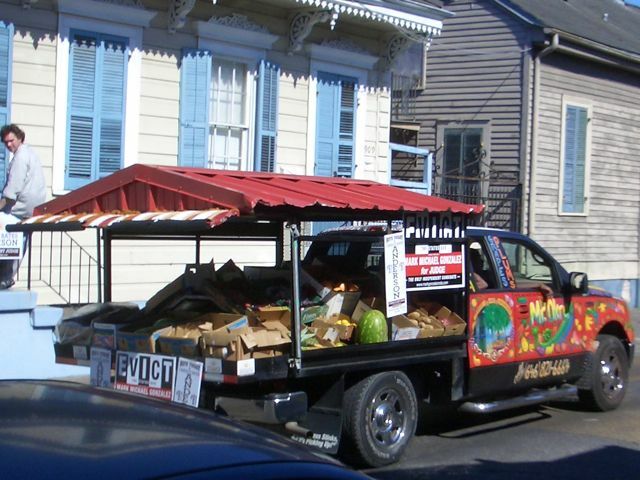 Before the storm, if you knew just the right folks, you could get your brake tag from a cab driver and maybe just buy him a muffaletta at “da grocery” on “da cornder” at Dauphine and St Philip! 🙂 been there, done that. You’ll be local in no time! Welcome and be careful. You got yer shoes on yer feet on _________street. That’s the answer if someone axes ya. So glad your legal now — and I love learning about the Brake Tag. Sounds like a very interesting town with something going on all of the time. We, Bob, Katie and I also like the weekend with all of the football games. Sat. is Michigan Univ. playing in the “Big Ten” games and Sunday is Redskins and Ravens games. Rick will probably not speak to me for a few days because the Ravens beat the Steelers last Sun. He gets depressed when they lose. Enjoy that lovely city that has stolen your heart. Has anyone else stolen your heart?